It is the first weekend in March which means it is time for the annual Rosehill Craft show. I went this morning. The Rosehill show the little sister to the big Sydney Quilt and craft show which is held in June each year, it is a smaller show but usually just as good. This year the craft show seemed to have a different feel to previous years. I know popular craft trends change from year to year and the show caters for what is most popular but I guess this year the trends that seemed to be at the show weren’t really my taste. Cake decorating seemed to be big this year and wedding planning so if liked those things you had lots of activities and shops to choose from. I’m more into fabric and yarn shops and activities and it seemed there were fewer of those than in previous years at Rosehill. Saying that there was a new store which I was really wanted to visit and basically only went to the craft show for and that was Lefty’s. I had no idea this shop even existed until I saw that it in the exhibitors list prior to the show. As the name suggests they sell left handed products. I discovered they had left handed dressmaking scissors and was hoping they would have them at the show. To recap my issue I’m right handed but cut fabric anti-clockwise which is apparently wrong for a right handed person. To use my seam allowance guide successfully I need left handed scissors. They had a variety of types but talking to the owner and discussing my problem he suggested I went with a pair that had a universal grip. A universal grip doesn’t have a thumb grove it which means you can comfortably use them in your right or left hand. The top blade is on the left hand side which is what I need. I did do one class as the show which was a last minute decision I only decided this morning before I left home. I discovered a jewellery making class. It wasn’t like a regular class where you met the teacher at a special workshop area at a designated time instead the class was held at the exhibitor’s stand and you basically went up whenever you wanted and made your item. I really liked this as it gave you the flexibility to do it whenever you had time or there was a spot free at the class station. You had the option of making a pendant or a cuff. I decided on a cuff as it is something I am liable to wear more. You stamp your designs onto your item using metal punches and a hammer. You were able to use any of the punches (letters, symbols, zodiac signs, pictures) they had available to create any design you wanted. There was no limit so you could do as many as you could fit if you wanted to. I saw they had a ying yang punch for sale but it wasn’t among the ones you could choose from however the store holder was kind enough to open the packet up so I could use it. Each person was given a practice piece to try out using the punches before they started their actual piece. My practice piece was horrible as it kept slipping. They stall holder gave me some tips and I got the hang of it. For my bracelet I opted for 4 ying yangs, they turned out great so I decided not to do anything else. I adore ying yangs so my bracelet was perfect with just the 4. 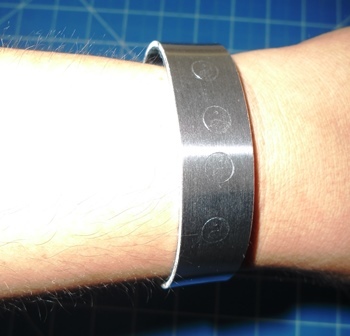 You do the punching out your design on flat metal surfaces afterwards you curve the cuff to get the round shape. I love my little bracelet. It certainly was my shortest Rosehill show as I only spent just over 2 hours at it. I did the things I wanted to do so it wasn’t a wasted trip. Crowd wise numbers looked down but Sydney is currently going through a very wet period so I’m guessing that is why. Hopefully next year it picks back up again. I have always said on here I will show both the good and the bad side of my crafting. I have a confession all my craft supplies (fabrics, magazines, books, notions, tools, wools) have exploded. I have never been a neat freak and am used to having lots of stuff around me (stuff not mess) but my craft stuff has gotten to a point that it is out of control and I’m starting to lose things as I put items down and things get piled on top of it. I’m getting to the point where I don’t know where to put things so I just stick them wherever. In my study I have a series of bookshelves. I keep craft books, magazines, craft dvds, containers full of supplies to make jewellery / bags / hair clips. On these shelves above I have started just shoving anything I find that don’t know where to put elsewhere. I have run out of space for craft books and magazines. 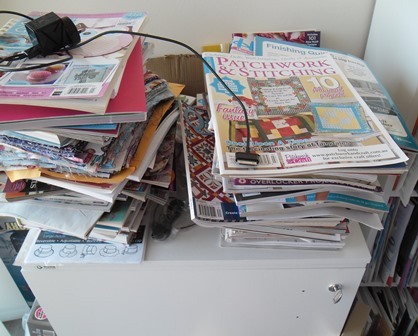 I have started piling my magazines and some books on chairs in my lounge room, the floor in this room and on the top of my 2nd horn sewing cabinet. I can still open the door to get my overlocker out but I can’t use the top of it. My spare room is probably my dumping room of the house. I have tubs of fabric against one wall. 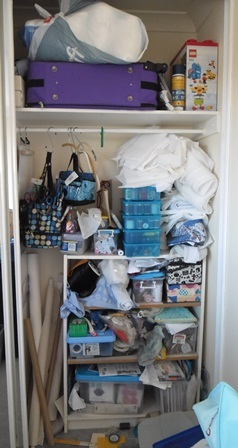 In my built-in wardrobe on one side I have tubs full of fabric, wool and the clear box is my finished gifts box but you can see I can’t easily get to it at the moment. I have a lot of random fabric in here. 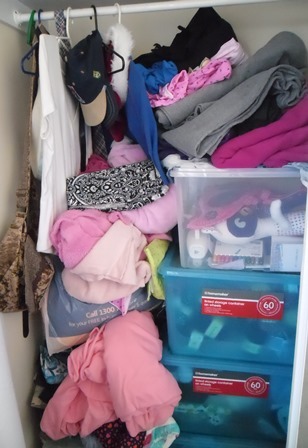 I recently had a rental inspection and lot of stuff got shoved into this wardrobe and that’s when I realised it is becoming a problem. 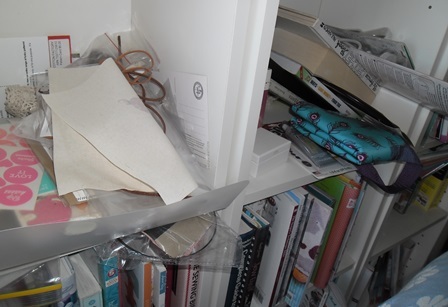 On the other side of the built-in I have a bookshelf which has patterns, craft machines, threads, sewing supplies, rolls of crafting supplies, You can see my interfacing is shoved in one corner. To get anything out of this I often have to move a lot of stuff. I couldn’t actually tell you what is in this pile here. Clothing, fabric, wadding, wool, packets of mum’s old pj’s would be my guess. 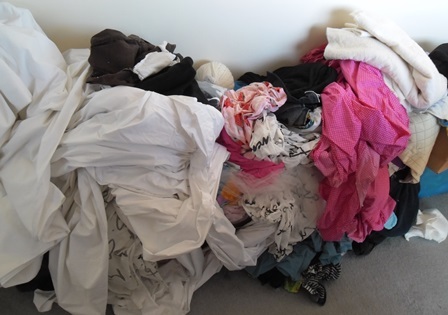 It is right opposite my indoor clothes airer so it becomes a really dumping ground. I cover it with white sheeting so not to expose it to a lot of light (only the morning sun) It is a mess. It is time to take action and to take control. My plan of attack is to basically do a big stocktake of all my items. ◊ I’m going to get rid of any books and magazines which I know I won’t use. I’m also not going to re-subscribe to magazines which I’m finding I’m not reading as much or getting use from. I’m limiting craft books. 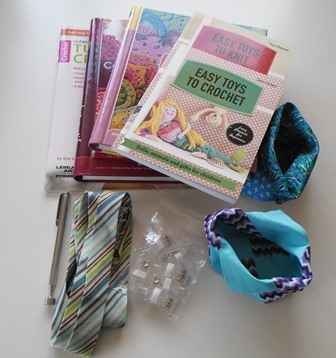 I have enough books on toys, knitting, crochet, mending, using my overlocker, making clothes. ◊ I will sort all my items so that I have like things together. I only want one place to keep zippers, one place for trims, one place for sewing tools etc. I will get rid of any excess of items if I’m not going to use them. ◊ For the fabric I’m going to measure each item and note down what I have via a private Pinterest board with a photo and size of each piece so when I get a pattern (particularly clothing) I can look through my board easily and see if I have any suitable fabric first. Any fabric that is too small to or I know I won’t use will be given away. ◊ I will handle my wool stash by going through it and any that I can’t use or I know I won’t ever get too will go. This includes the lovely alpaca yarn which I know I’m never going to get around to using. ◊ I will find better storage solutions for my items. My wool felt for example I would love to keep in drawers where I can access each pieces easily instead of squished into a zip lock bag which explodes each time you open it. This isn’t going to be something I do in one day or one weekend. It is a long term project that needs to happen so long term I can fix the problem from continuing to occur. It has hard to say but my craft supplies have turned to clutter. Crafting is meant to be my relaxation thing but it is starting to stress me out. When I had to tidy up for my recent rental inspection it was the tipping point of wait you have a problem. It is possible to have lots of stuff providing you fully know what you have, it is organised so you can find things easily and that you’re using it. I’ve got a fair collection of Wonder Clips or craft clips (Wonder Clips are the Clover brand) I use them to hold binding into place when I’m doing mini quilts, fold back areas of fabric when doing hand embroidery and to hold the fabric to papers when doing hexies but it wasn’t until I heard someone in a Facebook forum say she uses regularly instead of pins in her sewing that I thought that sounds like a great idea and I should try it too. Over the weekend I was making a softie that was very bulky. I used clips on the inside of him to hold his limbs out of the seam lines. Instead of pinning around the edge I decided to try clips instead. Oh what a difference it made. 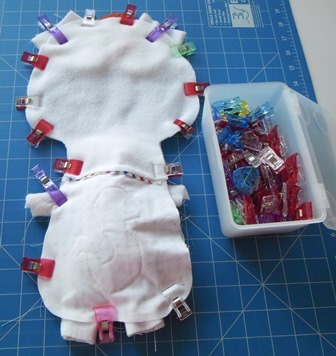 I didn’t have the worry about which direction I placed the pins so I could remove them easily, I could concentrate on my sewing and not worry about hidden pins that may go under the needle as I could see the clips. After I had stitched around the outside I removed the clips that were securing the limbs via the turning gap then turned out the toy, this was so much easier than having to poke around trying to remove a pin from the inside or trying to turn out the toy with the pin still in place. Another good thing was no bent pins. I have many a banana shaped pin that has protested about being put through so many layers of a softie or bag. Now in future I will clip first pin second. You can find Wonder Clips or the generic version of them in the quilting notions section in most sewing shops. There are a heap of online places and ebay that sells them too. There are even some for knitting (which I have a set of) They are a longer clip. In the above picture the purple ones are the knitting ones. 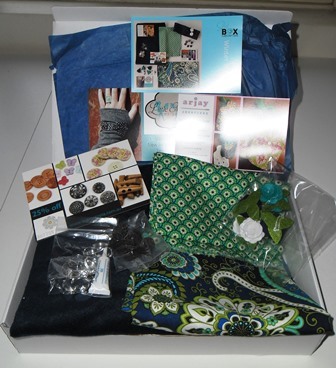 I don’t use my Sizzix Big Shot (or now known sometimes as Fabi) as much as I should. 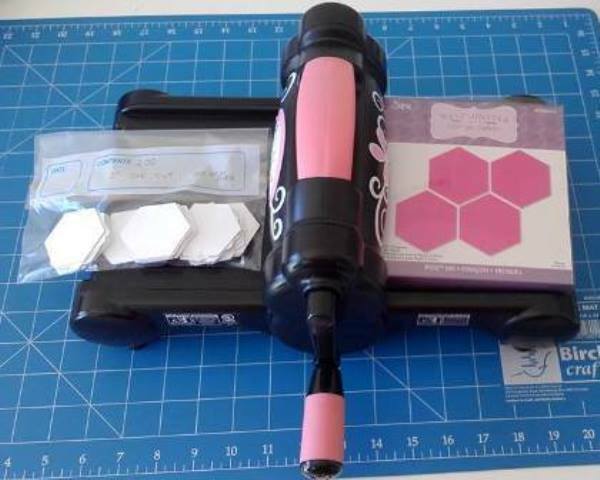 It is a great little die cutting machine that you can cut fabric, paper, foil or balsa wood on. One way which I have used it many times is to cut hexie papers which are used in English Paper Piecing (EPP) This machine is perfect for cutting the papers on. I wanted to cut a batch recently for a craft swap. By folding the computer paper into quarters and placing it over the cutting die I was able to cut 16 hexies at once. I then experimented and discovered I could do 2 sheets of paper at once cutting 32 at a time. I was able to cut a total of 200 papers in a matter of minutes. It was brilliant! These hexies are 2″ but you can get a variety of sizes. Cutting your own papers saves so much money and time. I could never cut the papers as neatly as this machine does. I find it hard to let go of projects even though I know realistically I will never get them finished or if the idea in my head hasn’t worked out when I’ve tried to create it. To clear my space for projects that I will actually finish or that will actually work I’m doing a clear out. I had planned to do the Cozy Afternoon Block of the Month I was going do each one as a stitchery and make it into a quilt at the end. I started block 1 and almost completed it but unfortunately that’s as far as I’ve gotten. 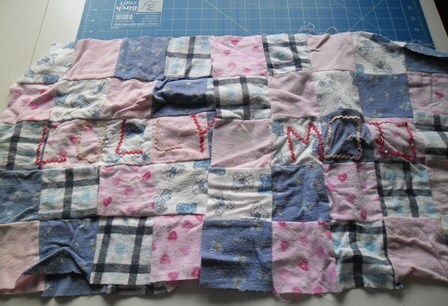 I’ll finish this block off and turn it into a mug rug but that’s as far as I’m going on this project. I have the Winter Secrets block by block stitchery that will be turned into a quilt which I have started which I’m going to concentrate on more this year instead so Cozy Afternoon goes. This item I’m debating about letting go or not. 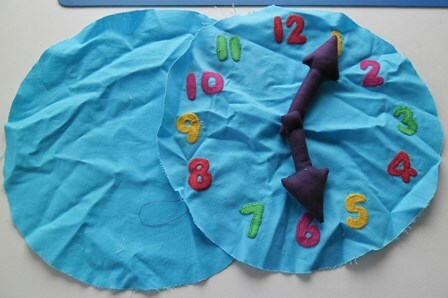 I was trying to design a clock soft toy where you could move the handles to change the time. It was going to be like a pillow. When I attached the clock hands I couldn’t get both to move freely. It has to be possible so I may keep on to this for a little longer to see if I can the right way to attach them hands. The idea is still really strong in my head and I do have child in mind who could get this as a present. Ok so I thought I would have more projects to toss out but I only found 2. Oh well at least that is a start. If I unearth anymore throughout the year (I’m searching my brain and can’t think of anymore off hand) I will have a serious look at them and decide to stay or go. 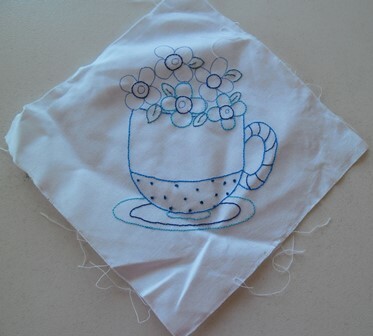 Yesterday I went to the big Sydney Craft and Quilt fair that is held every June. As always craft fairs equal shopping. I got some items that were on my list including some binding to match a project I’m working on and an extendable magnet to pick up pins from the ground. Each year I buy something that the ladies from the Quilters Guild make to raise funds for their guild, this year I got a couple of thread catches cause you never have to many of them (I just have to remember to use them) I also purchased an adjustable sewing bed extension table but I haven’t had a chance to try that out yet. Just as I was leaving I got some craft books which weren’t on my list but craft books are my weakness. Another new thing I got which I can’t wait to try is little torches that slip over your thumb so when you’re doing hand embroidery your stitch area is illuminated. This year I didn’t do any workshops or listen to any talks. I wasn’t even sure if I was going to even make the event or how long I could stay at it so I didn’t want to commit to anything. The June craft show in really good to go to as it has all the quilts on display. Unfortunately I couldn’t take photos of them as you need to have the owners permission. Now that I have done a bit more quilting than I had before it was interesting seeing them and trying to work out how they did it. I’m in awe of people who can do any size quilt. I struggle with a mug rug and that is tiny. After the show I stayed the night at Star City like I’ve done in previous years. 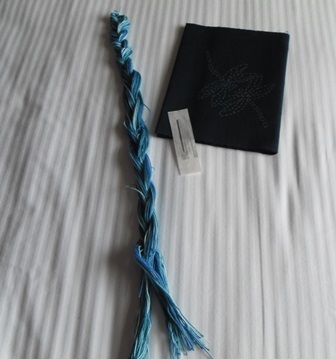 I however didn’t pack any craft for me to do at the hotel. Normally I do a class or something so I have something to work on afterwards. If I go away for a couple of days I automatically pack something. At the show when I realised this I started to get really anxious as I need to do something to keep myself occupied. All I had on me was a pair of embroidery scissors in my wallet. 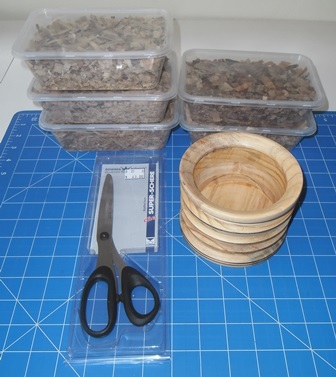 I walked around the different stalls trying to find a project I could start immediately that didn’t involve any prep work and used limited tools. I decided on sashiko. I brought a panel and a skein of thread and the lovely girl gave me a free needle as she could see how desperate I was. Lesson learnt at least throw in a pair of knitting needles and a ball of yarn into your overnight suitcase. I actually got a lot done on the panel during my stay. I enjoyed my day at the show. Maybe next year I can do a class or maybe even volunteer at the Knitters Guild display stall.